Patchouli was first described by botanists in the Philippines in 1845. The plant originated in Southeast Asia and is extensively cultivated in various Indonesian Islands, India, Philippines, Malaysia, China and South America . Today growing interest in its fragrance has led to patchouli's widespread cultivation throughout tropical Asia. The name "patchouli" ("patch" meaning leaf and "ilia" meaning green) originates from India. Patchouli is a member of the mint family. 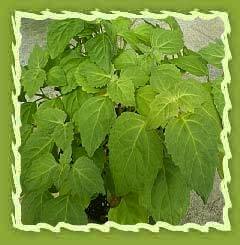 It is a large 3 feet perennial mint which grows in tropical climates. Patchouli oil has a rich musky-sweet, strong spicy and herbaceous smell. It is light yellow to dark brown in color and is a thick oil. Chemical constituents: Patchouli oil has various chemical compounds that include b-patchoulene, guaiene, caryophyllene, patchoulene, seychellene, bulnesene, norpatchoulenol, patchouli alcohol and pogostol. Extraction: It is mainly extracted by steam distillation of dry leaves. Patchouli essential oil is used as a tropical remedy for skin problems such as acne, eczema, inflamed, cracked, chapped and irritated skin. It is known as a cell rejuvenator and helpful in healing wounds and scars. As an antifungal it has been used to treat athlete's foot. It helps to reduce tension, insomnia and anxiety. It is also know as uplifting fragrance that helps to soothe away everyday cares and to bring about a sense of nourishment. The very intense aroma is described as earthy, rich, sweet, balsamic, woody and spicy. It is said to be a good sedative, nerve tonic and aphrodisiac. It is also used to combat depression, frigidity, anxiety, dandruff, wrinkles, herpes and other fungal infections. Patchouli oil has a grounding and balancing effect on the emotions and banishes lethargy. While sharpening the wits, fighting depression and anxiety. It is also said to create an amorous atmosphere. With its excellent diuretic properties it is effective in fighting water retention and easing constipation and helping to reduce overweight. Patchouli oil is very effective in sorting out rough, cracked and overly dehydrated skin and is used to treat acne, acne, eczema, sores, ulcers, any fungal infections as well as scalp disorders. The major use for patchouli oil is in perfumery. Patchouli oil is considered as an excellent base note and fixative in perfumery, being a component in many famous perfumes. As a fixative, it slows the evaporation of other more volatile oils so that their aroma may be released over a longer period of time. A little patchouli can be used in natural perfume blends, adding special deep and earthy aroma. It mixes well with many other essential oils. It is often the fundamental note in oriental-type of perfumes which are sold at very expensive rates. Patchouli blends well with sandalwood, bergamot, cedarwood, rose, sweet orange, cassia, myrrh, ylang ylang, opopanax, and clary sage. Patchouli is a component in about a third of modern, high-end perfumes including more than half of perfumes for men due to its heavy odour. Patchouli is an major ingredient in manufacturing of incense. Patchouli incense are very popular and preferred form of incense used in Chinese and Japanese cultures, thus most of the incense produced in those countries are in stick form. It is largely used in places of worship. Incense is available in numerous forms and degree of processing. Incense are mostly mixed into a oil of patchouli , as carrier and wood powder or other solid fragrance material, before being formed into incense. Incense made primarily from patchouli oils are mainly used for pleasure and burned for their fragrances alone.These oil based incense is usually cheaper than original material incense.